Hawaiʻi-based educators are invited to participate in our curriculum trainings created especially for teachers who want to use ʻĀINA In Schools lessons with their students! These trainings are the first of a two-part series which will cover the ʻĀINA In Schools units. Fall training dates are listed below. Trainings for the spring lessons will be held in January. Oʻahu ʻĀINA Garden & Compost Curriculum Training: Saturday, September 6, 2014. This training will cover the standards-based fall garden units and the first four lessons of our eight lesson composting curriculum. The garden-based learning lessons are written for grades K, 1, 4, and 5, and the compost lessons are written for grade 3, however all can be adapted for use with other grades. Lessons are 45 to 60 minutes each and are recommended for once a month delivery over the course of the fall semester, with garden care required between lessons. This training date also offers an overview of composting and the ‘ĀINA Compost Curriculum. Click here to register. DOE teachers can also register for PDE3 Course CTE179108 to earn Professional Development Credit. Oʻahu ʻĀINA Nutrition Curriculum Training: Saturday, September 13, 2014. This training will cover the first four lessons of our eight lesson nutrition education curriculum. Our standards-based nutrition lessons are written for grades 2 and 6, and can be adapted for use with other grades. Lessons are 45 minutes each, include a healthy snack tasting for students, and are recommended for once a month delivery during the fall semester. Click here to register. DOE teachers can also register for PDE3 Course CTE179119 to earn Professional Development Credit. 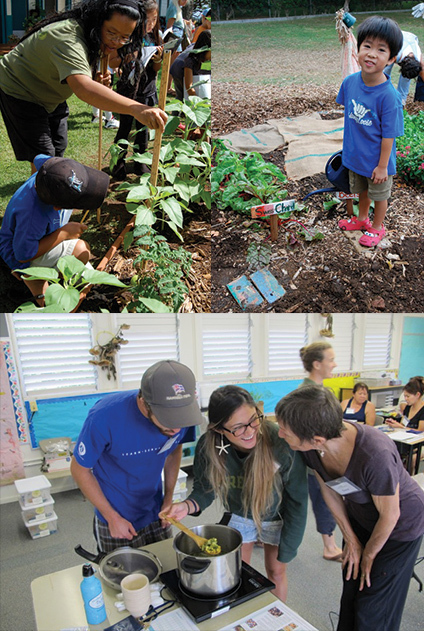 Maui ʻĀINA Garden, Nutrition & Compost Curriculum Training: The ʻĀINA Team will be bringing ʻĀINA Educator Trainings to Maui on September 20th in partnership with the Maui School Garden Network. Sign up here.